It was Easter Sunday morning in my church back in Petaluma, CA. I was dressed in a nice new dress shirt… unusual for me in my northern California church. (I usually wore a polo.) I entered the sanctuary from the front and was humming to myself “Christ the Lord is Risen Today” when I heard : “Pastor, come quick. I need you!” One of the women of our church was calling me from the back. I quickly perceived that my church member was engaged in an altercation with a strange woman I had never seen before. It seems that this woman had wandered in the front door and exhibiting signs of mental illness became obsessed with our Bible on display in the foyer. It was one of those large coffee table Bibles. When my church member called me, the woman suddenly grabbed it and was made off with it. As I watched her with this 50 pound Bible tucked under her arm making her getaway… I had another thought: “At least now it might get read.” It reminded me of the coffee table Bible we had in our home as I grew up. Never saw it opened. Never saw it read. Jesus once told a parable: A farmer went to sow seeds: some on the path in full view of hungry birds, some on a rocky hillside where the plants could not put down roots so they withered in the sun, some were sown among thorns where the plants grew up but were then choked to un-fruitfullness… but some were sown on good rich soil where the plants grew tall and plentiful. I don’t know about you, but I want to be the soil that grows the big crop. I don’t want be some sickly garden; I want my life to be robust and healthy. I want there to be fruit in my garden to share with others. But I’m not sure my soil is always soft. You see, I get seed slung at me all day long… and most of it is not God’s word. My email inbox, the Nightly News Cast, a casual conversation with a friend, or a blog about something that interests me, they each throw at me… opinions, ideas, theologies, and world views each hoping to raise up a crop in me. What happens after being bombarded day after day? My soil gets hard. I become less a student and more a skeptic. And yet… I still want that good crop! How do I get it? There is a word that can help you and I get to a rich crop of righteousness… that word is “receptivity.” In Jesus’ parable, the seed is sown… and all the soil can do is accept or reject the seed. Are you adept at accepting the Word of God? Or does it sit unopened week after week… its life changing message doing nothing for you. Soren Kierkegaard reminds us: “To truly hear the word of God is to say over and over again to yourself, ‘It is talking about me, and it is talking to me.’” He who has ears to hear… let him hear. Yes, Jesus was talking about you, and he is talking to you. What condition is your soil? Do you have ears to hear today? (By the way, this heist wasn’t unique apparently. 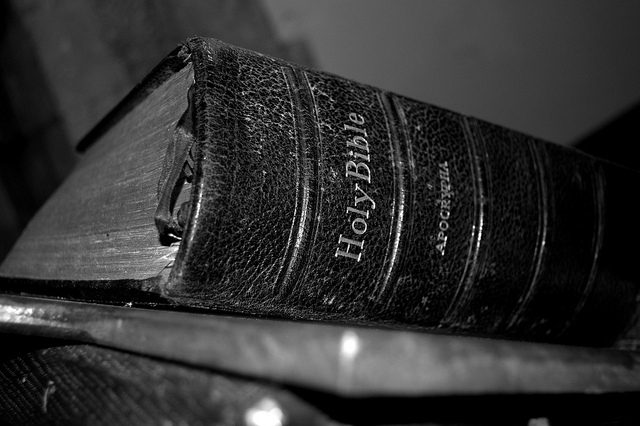 Read: http://999thepoint.com/woman-busted-for-stealing-a-bible-from-bookstore/) Blessed reading!